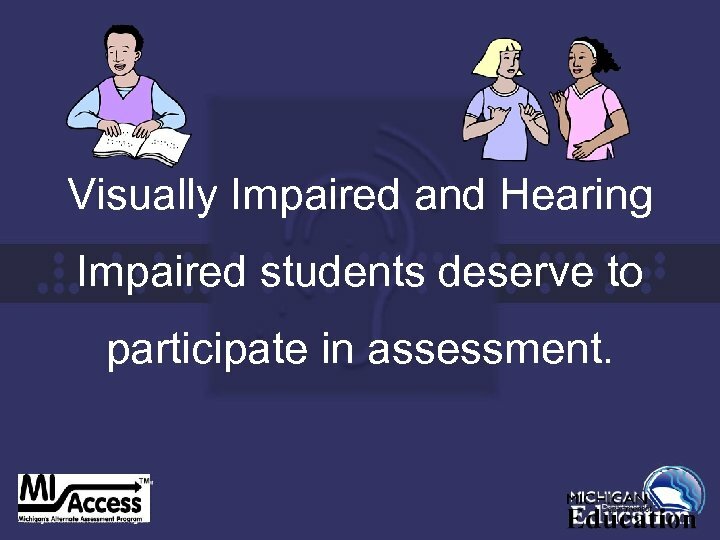 Visually Impaired and Hearing Impaired students deserve to participate in assessment. 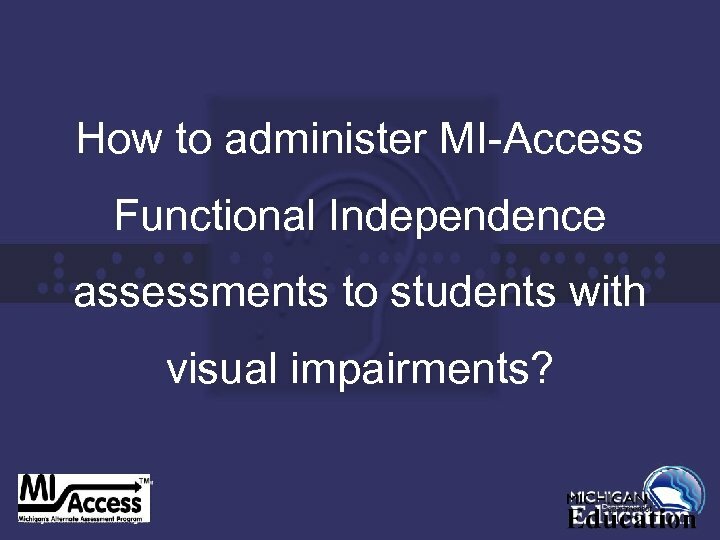 How to administer MI-Access Functional Independence assessments to students with visual impairments? 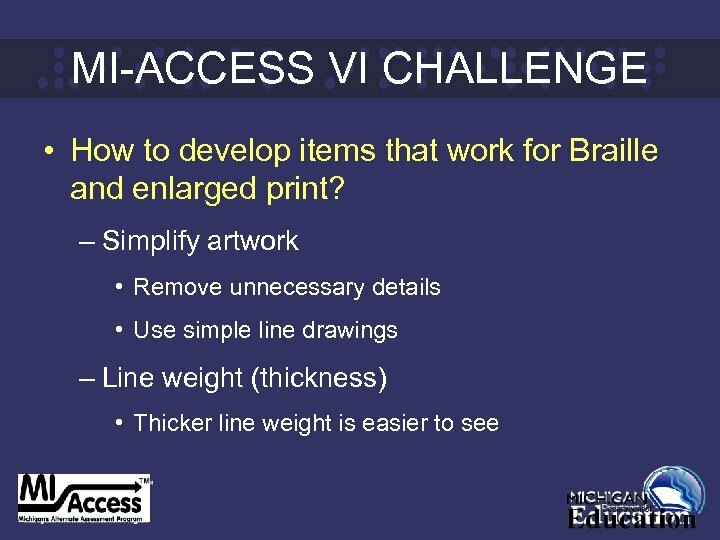 MI-ACCESS VI CHALLENGE • How to develop items that work for Braille and enlarged print? 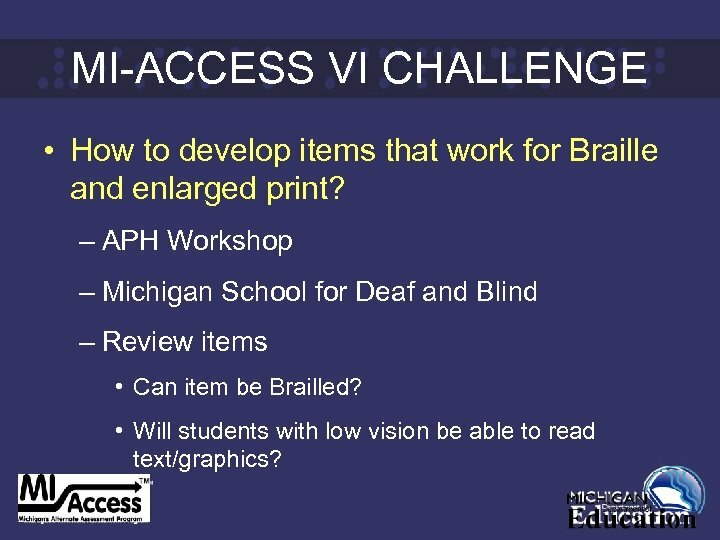 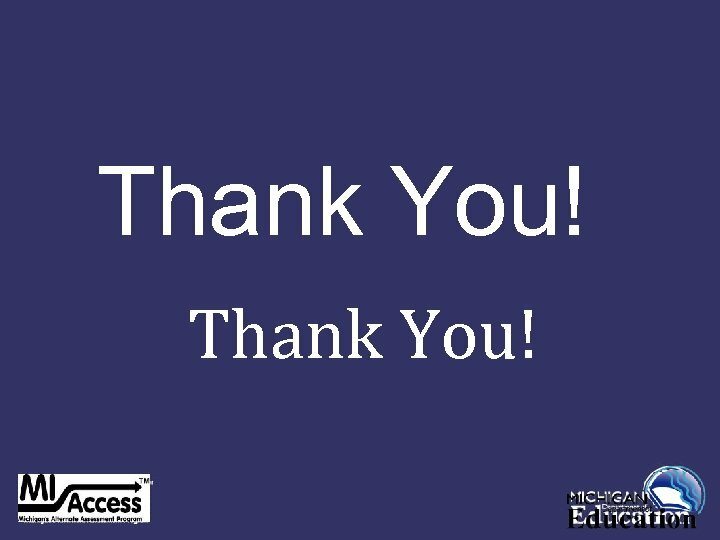 – APH Workshop – Michigan School for Deaf and Blind – Review items • Can item be Brailled? 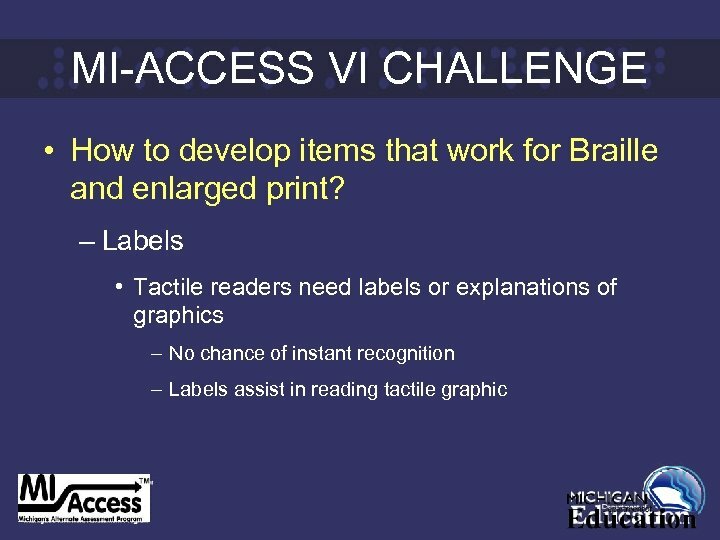 • Will students with low vision be able to read text/graphics? 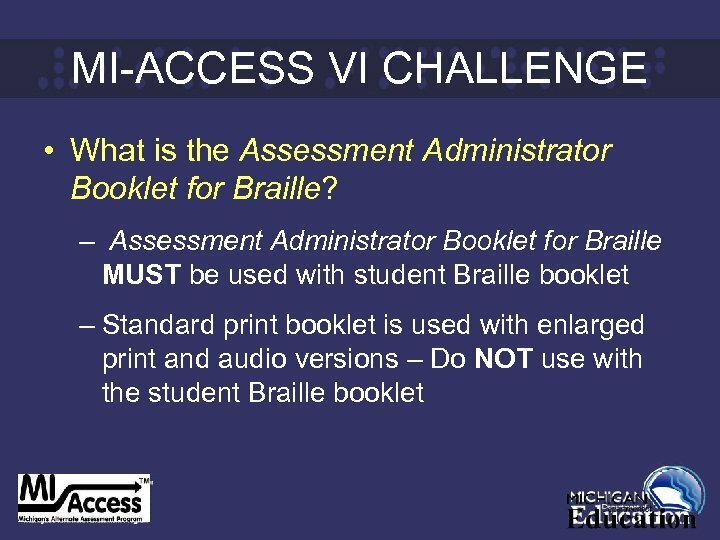 MI-ACCESS VI CHALLENGE • What is the Assessment Administrator Booklet for Braille? 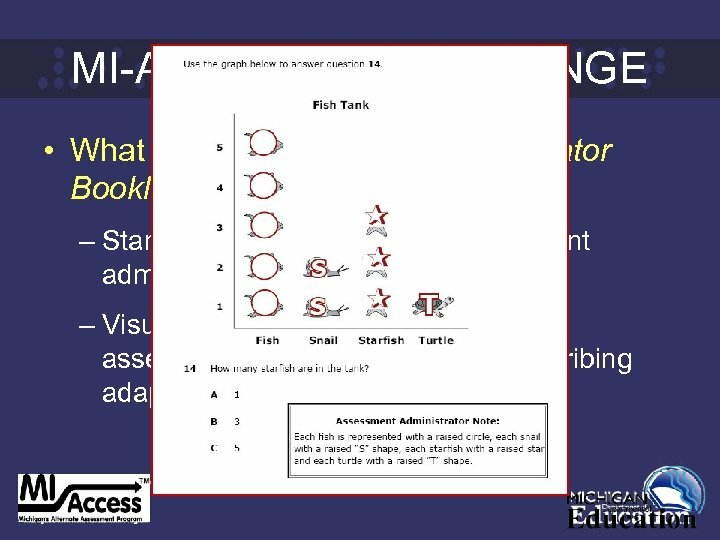 – Standard print booklet with assessment administrator notes – Visual depiction of changes and/or assessment administrator notes describing adaptations. 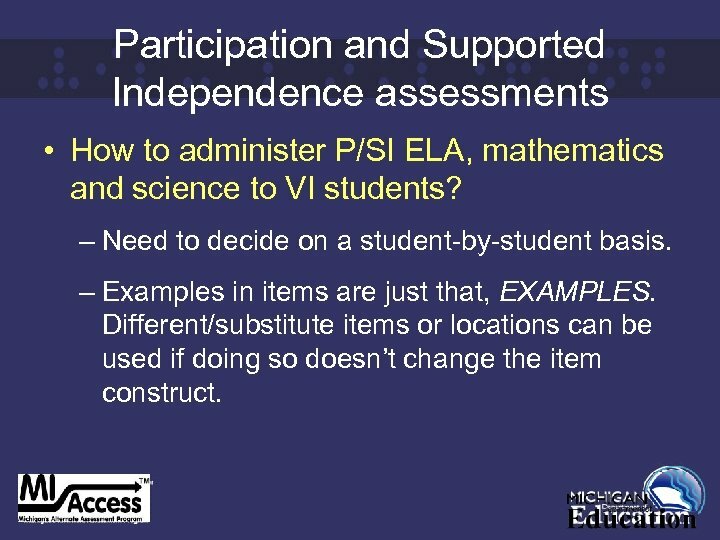 Participation and Supported Independence assessments • How to administer P/SI ELA, mathematics and science to VI students? 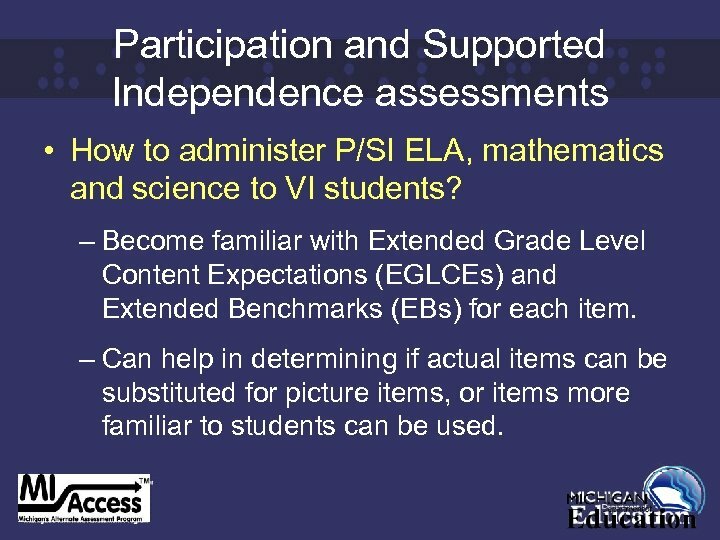 – Become familiar with Extended Grade Level Content Expectations (EGLCEs) and Extended Benchmarks (EBs) for each item. 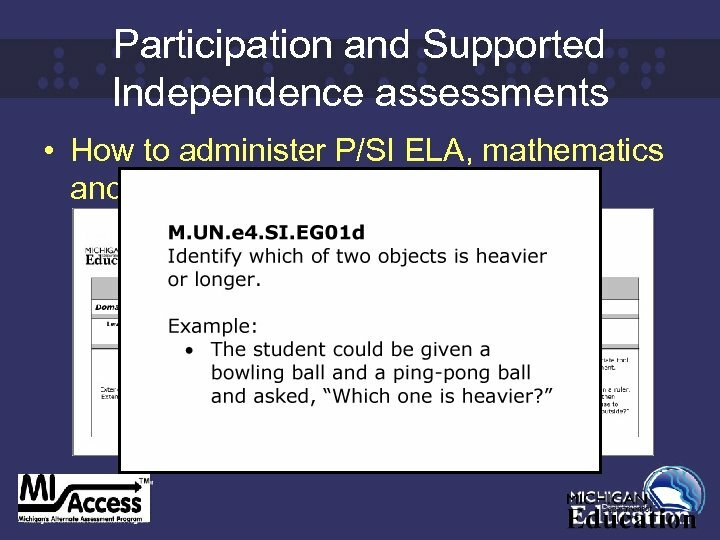 – Can help in determining if actual items can be substituted for picture items, or items more familiar to students can be used. 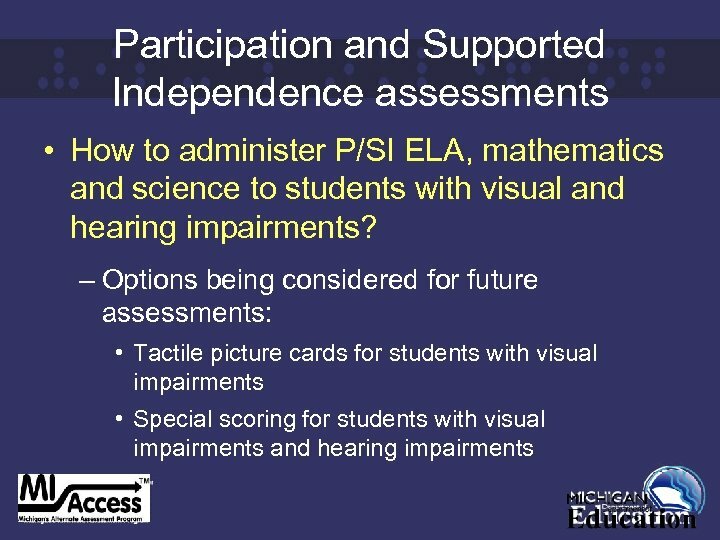 Participation and Supported Independence assessments • How to administer P/SI ELA, mathematics and science to VI students? 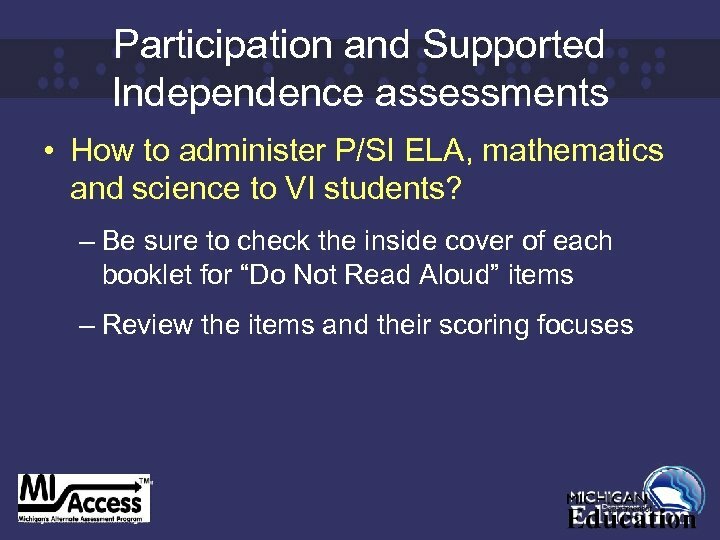 Participation and Supported Independence assessments • How to administer P/SI ELA, mathematics and science to VI students? 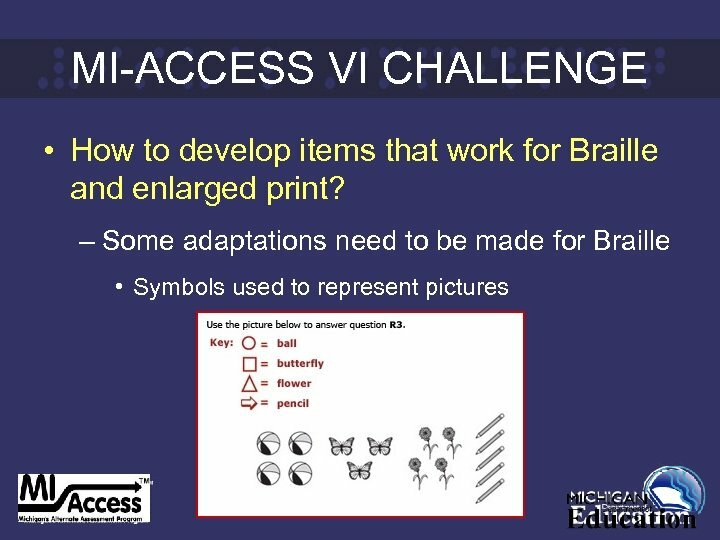 – Need to decide on a student-by-student basis. 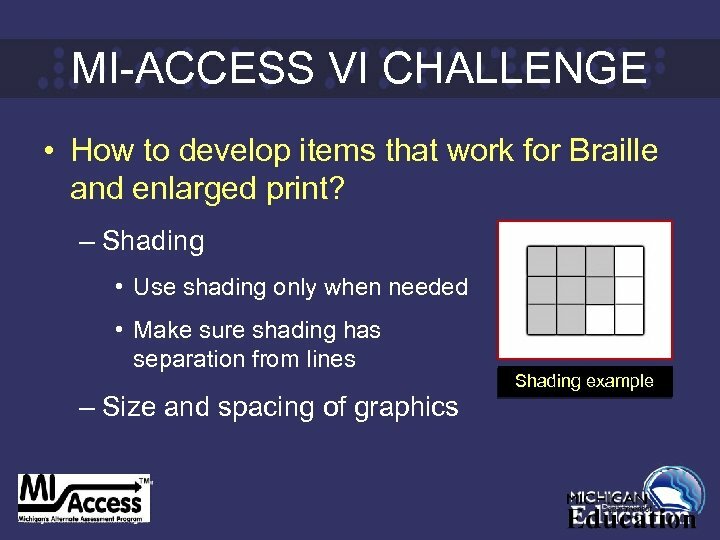 – Examples in items are just that, EXAMPLES. Different/substitute items or locations can be used if doing so doesn’t change the item construct. 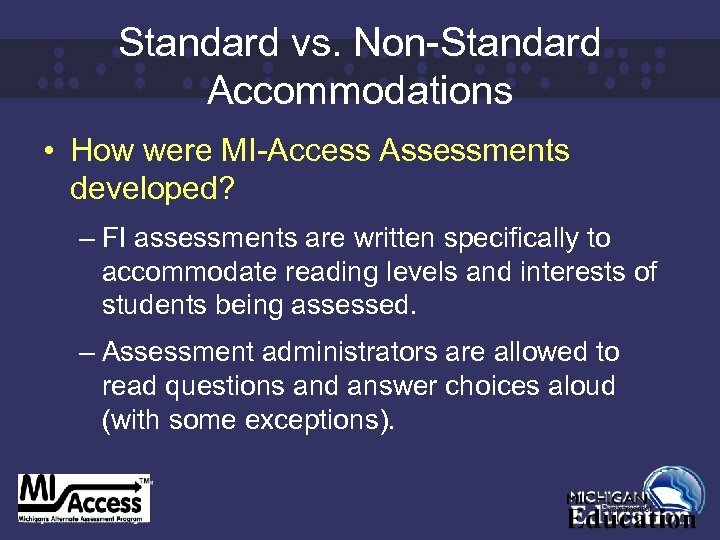 Standard vs. Non-Standard Accommodations • How were MI-Access Assessments developed? 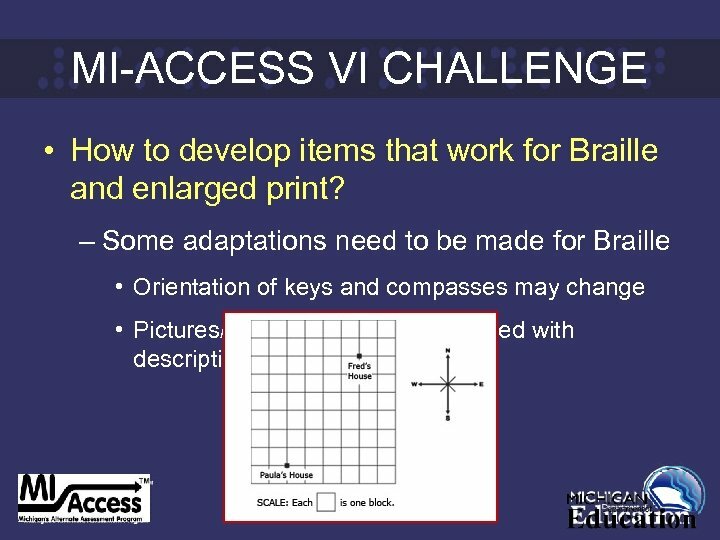 – MI-Access assessments were developed using universal design principles. 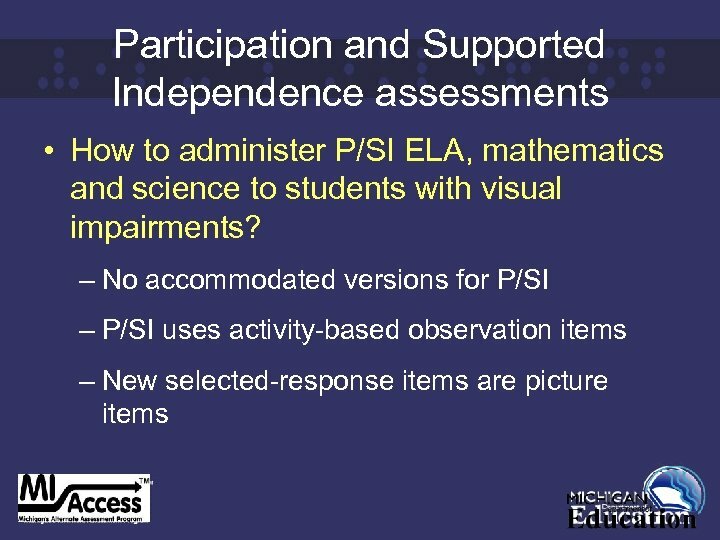 – Many of the P/SI items use an activity-based format, because traditional paper and pencil tests were not considered appropriate. 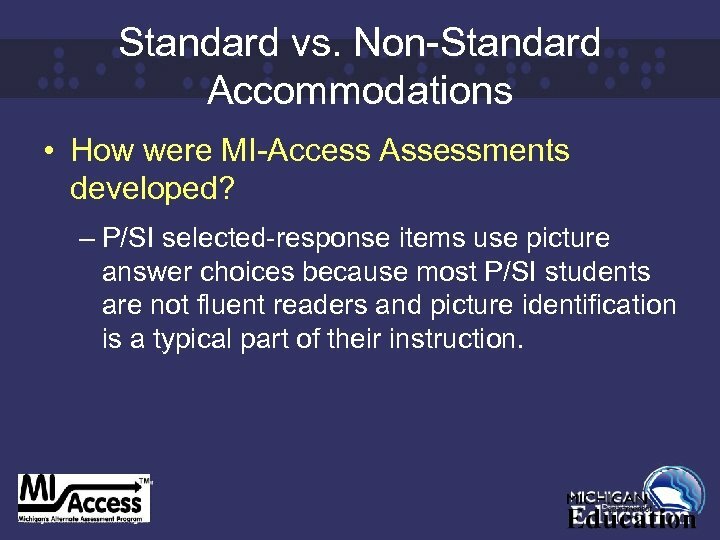 Standard vs. Non-Standard Accommodations • How were MI-Access Assessments developed? 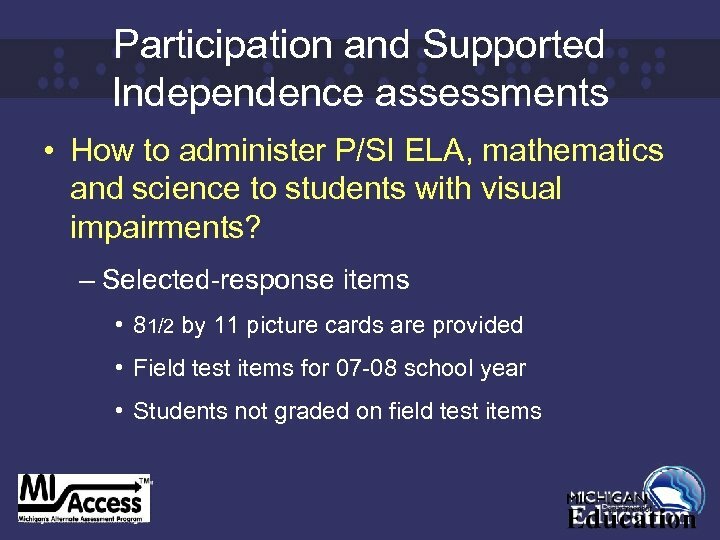 – P/SI selected-response items use picture answer choices because most P/SI students are not fluent readers and picture identification is a typical part of their instruction. 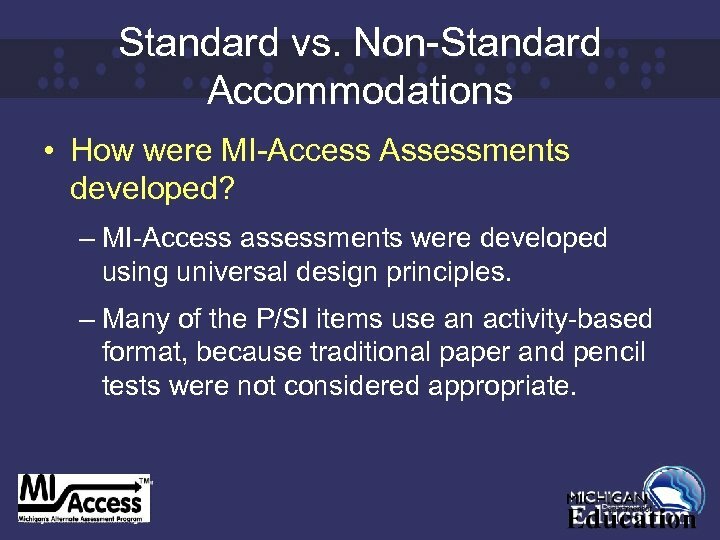 Standard vs. Non-Standard Accommodations • How were MI-Access Assessments developed? 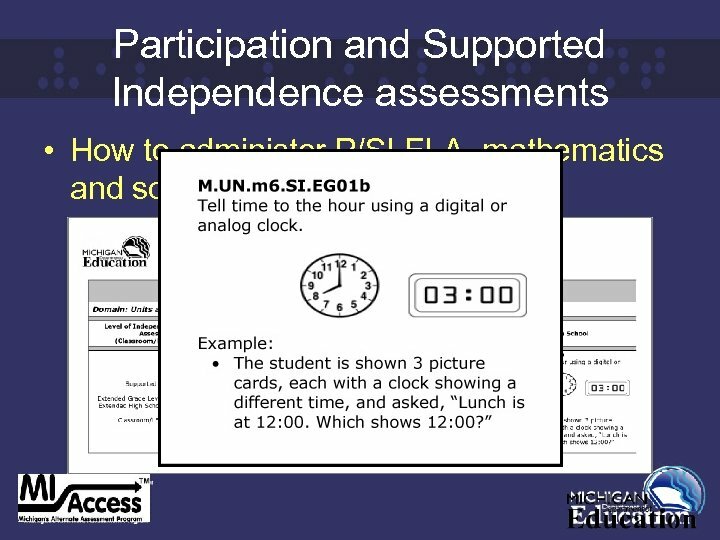 – FI assessments are written specifically to accommodate reading levels and interests of students being assessed. 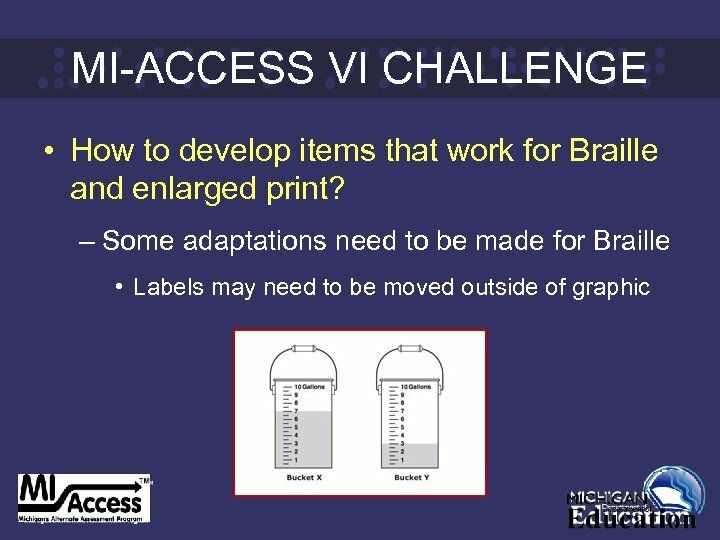 – Assessment administrators are allowed to read questions and answer choices aloud (with some exceptions). 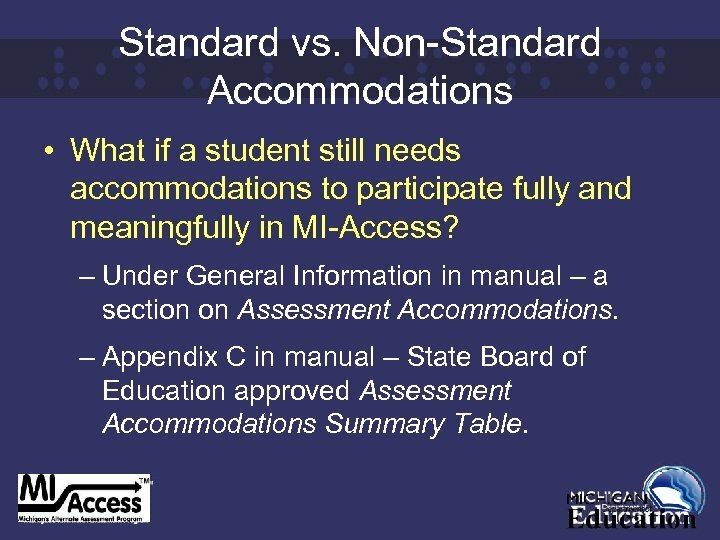 Standard vs. Non-Standard Accommodations • What if a student still needs accommodations to participate fully and meaningfully in MI-Access? 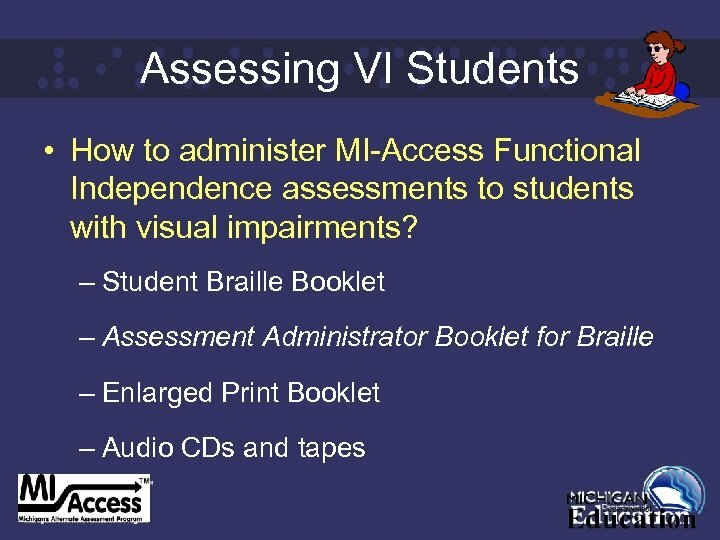 – Under General Information in manual – a section on Assessment Accommodations. 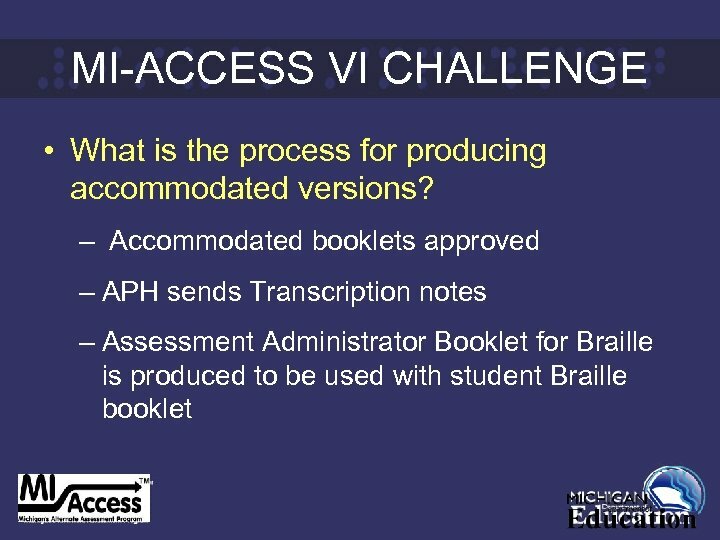 – Appendix C in manual – State Board of Education approved Assessment Accommodations Summary Table. 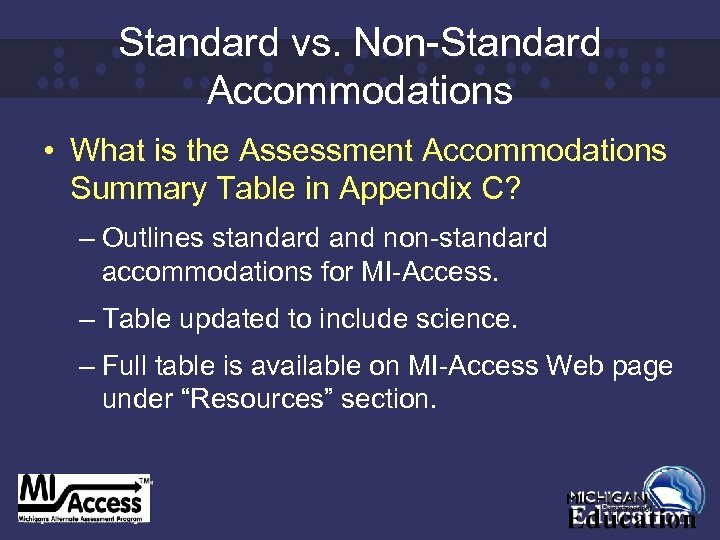 Standard vs. Non-Standard Accommodations • What is the Assessment Accommodations Summary Table in Appendix C? 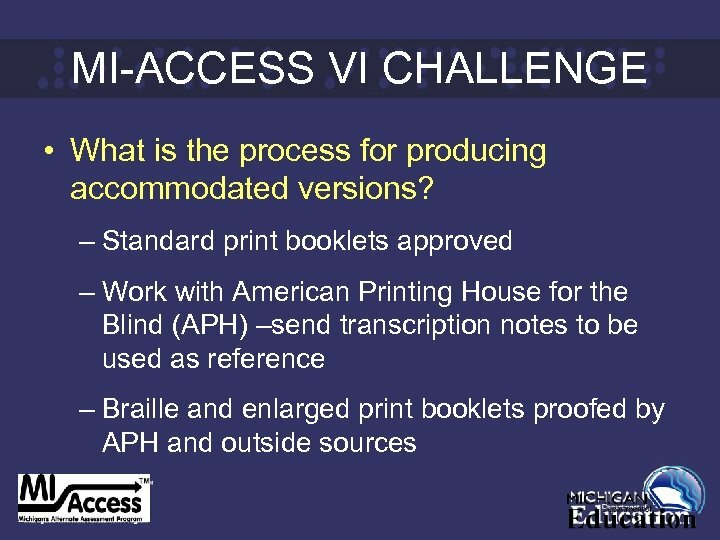 – Outlines standard and non-standard accommodations for MI-Access. 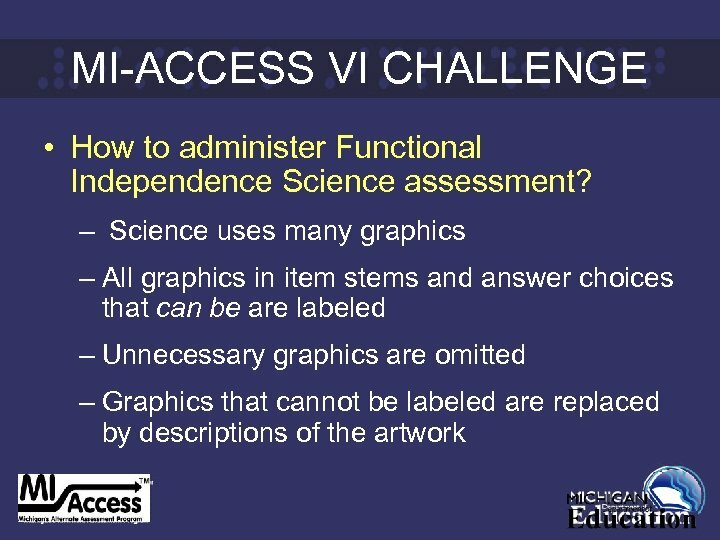 – Table updated to include science. 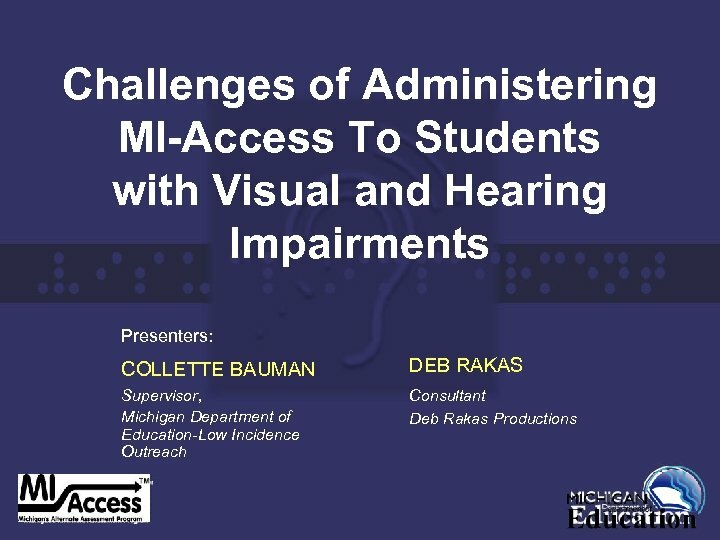 – Full table is available on MI-Access Web page under “Resources” section. 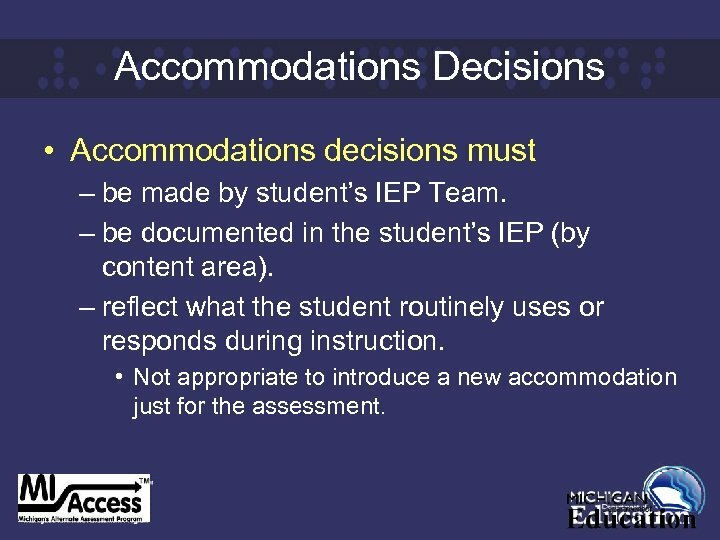 Accommodations Decisions • Accommodations decisions must – be made by student’s IEP Team. 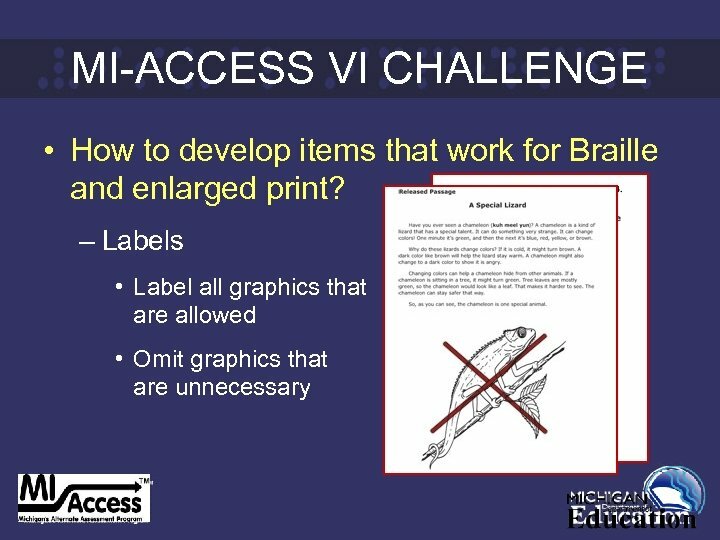 – be documented in the student’s IEP (by content area). 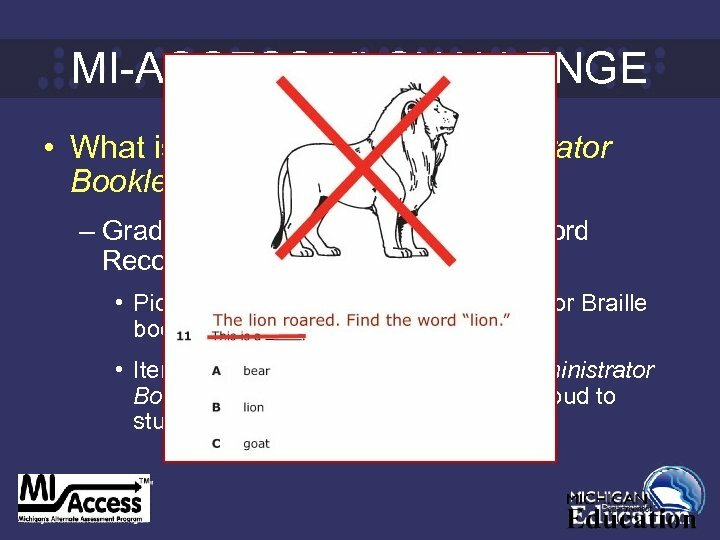 – reflect what the student routinely uses or responds during instruction. 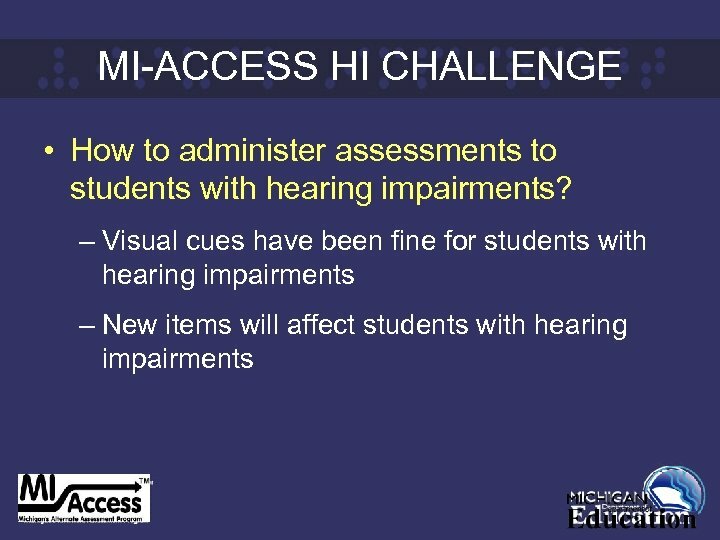 • Not appropriate to introduce a new accommodation just for the assessment.